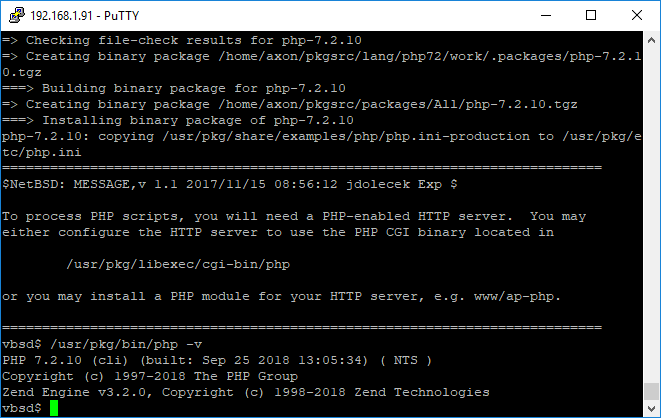 After a discussion somewhere on teh webs, I decided to dig into the state of PHP 7.1 and PHP 7.2 on OpenBSD. The short version is "we're working on it" (in OpenBSD ports) but no ETA. However, being keen to NetBSD's pkgsrc distribution, I knew that they had been cooking up newer versions in their software tree. So I decided to kick the tires. Pkgsrc is roughly NetBSD's equivalent to the OpenBSD/FreeBSD "Ports" repository, however, they've put significant effort into making it quite portable. It works in one way or another on other BSDs, Linux, OS X and even more esoteric platforms like Haiku and Illumos. Initially, bootstrapping pkgsrc on OpenBSD 6.3-STABLE didn't work. Buried deep in my inbox from the pkgsrc mailing list in April, I found a hint from Sevan Janiyan about some patches that are needed to make it work. Partially, this is because OpenBSD uses both clang and gcc compilers in the base distribution on modern hardware. Anyhow, on with the show. It's going to churn for a few minutes while it downloads all the files. 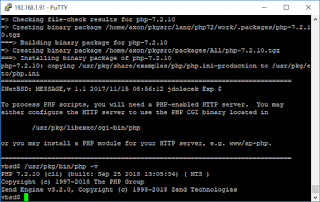 If you wish to build "unprivileged" without root, the binary packages will be installed in the "pkg" directory under your home dir. Then go have a coffee or something. It takes a while. 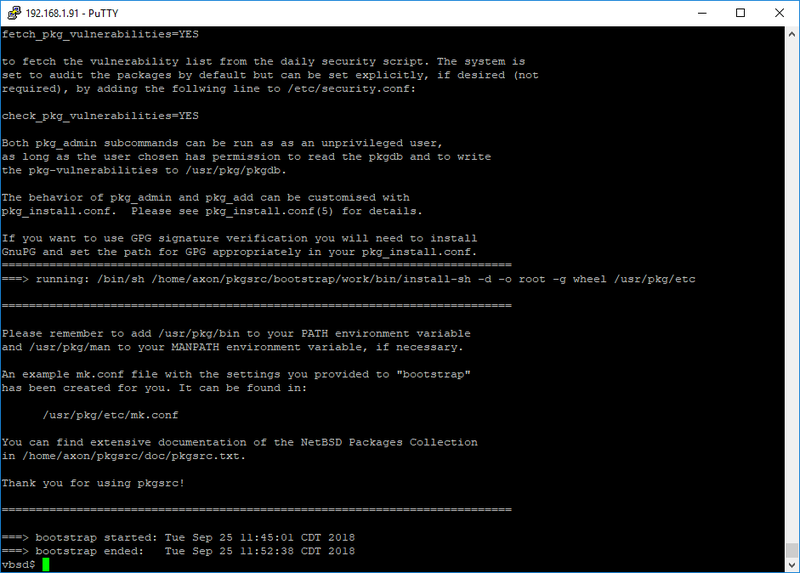 You'll need to edit your .profile (or .bashrc if you roll that way) to add the pkg/bin directory to your path. 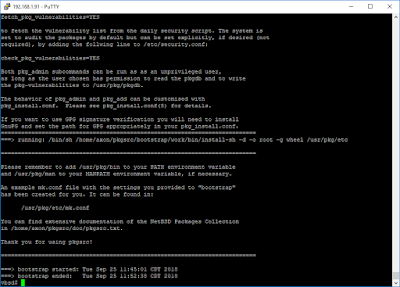 In a privileged install, add /usr/pkg/bin and /usr/pkg/sbin to your path. In an unprivileged install, add ~/pkg/bin and ~/pkg/sbin instead. You need that in your path, because pkgsrc portable requires you to use NetBSD's "bmake" in the pkgsrc tree, and bmake is compiled as part of the bootstrap. You can log out and log back in, or just run this command to get bmake into your working path. Let's try building something. It works a lot like ports. It will recursively build any dependencies or libraries that are needed, and install them into the pkg directory before building the application you're trying to compile. 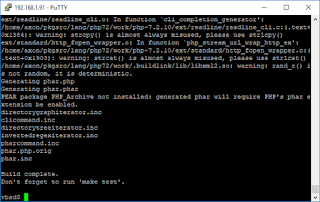 I'll start with the latest version of PHP in pkgsrc, PHP 7.2, since that's how this whole journey started. I'm using doas since I did a privileged install. 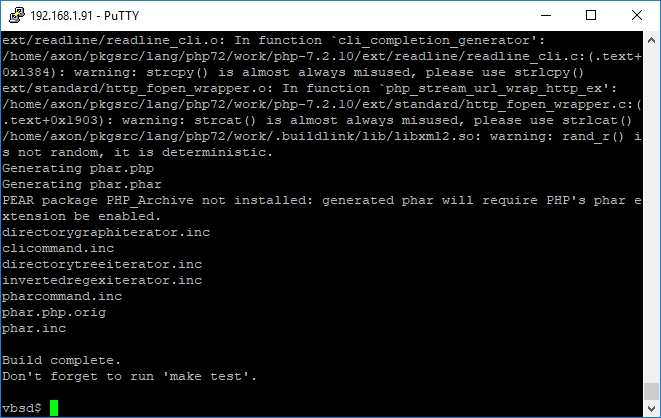 I'm going to run doas bmake install without running bmake test because pkgsrc isn't the boss of me.